Walter Bell was an extraordinary person, and this was clear even when he was a child. He was born in 1880 near Edinburgh, and by the time he was six, he had lost both parents. When he was ten, he took a pair of muzzleloading dueling pistols, a watch, and a few pennies and set off for America to go "bison shooting"! This scheme failed spectacularly when the stationmaster grabbed him as he was about to board the train, but other adventures soon followed. Never interested in school, he was, however, consumed by the writings of Gordon Cummings and thoughts of hunting elephants. He was not quite a teenager when he enlisted on a sailing ship in hopes of reaching Africa . . . but landed up in Tasmania. By the time he was fourteen his exasperated family bundled him off to a boarding school in Germany in the hopes of getting some sort of education in him, but once there he built a rough sort of kayak and managed to get to the coast via the river system and eventually back home by taking a steamer and trains. Finally his siblings relented and let him go to Africa. This was obviously no ordinary boy! Not even seventeen years old, he arrived in Mombasa with little more than a .303 single-shot rifle. This initial foray proved unsuccessful and unprofitable, so he took a steamer back to England and arrived home penniless. Refitted and a bit wiser, he then sought his destiny in the Yukon, mining for gold and providing game for the camps in the Klondike. Again penniless after having been cheated by a partner, he enlisted in the Canadian army to fight in the Boer War, which would also provide a means of returning to Africa. Now finally all elements fell in place: more wisdom through maturity, some funds, the right rifles, and a great deal of determination saw him make his first safari for ivory. 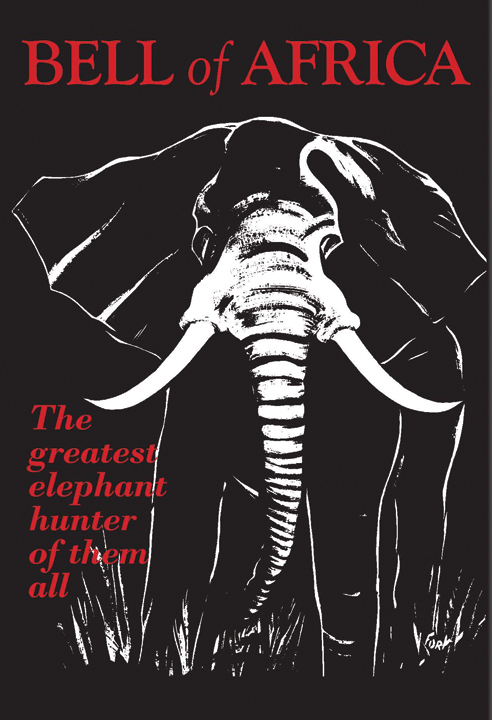 Like a tiger after its first kill, he developed a taste for elephant hunting, and he subsequently made what are generally considered the greatest ivory-hunting expeditions ever conducted by a single hunter. Bell began writing Bell of Africa, his third and last book, in the late 1940s but he died before it was completed. Col. Townsend Whelan took over the editing and finished the book, which contains some revised sections of Bell's earlier books but is, for the most part, all new material. In addition, this book contains Bell's own original drawings that depict scenes from his youth as well as his much-praised sketches of where to place brain, heart, and lung shots on elephants. These drawings were for a long time the only true anatomical studies of the position of an elephant's brain. Possibly the great secret to Bell's success-besides his extraordinary skill with a rifle-was his ability to think like an African. Bell was so good at understanding the mentality of the Africans he hunted with and encountered that he was able to get them to cooperate on his ivory-hunting expeditions to an astonishing degree. This clearly shines through in his books. There may be men who have led an adventurous a life, but not many of them were as daring and courageous as Walter Maitland Dalrymple Bell! Submit your review for "Bell of Africa"